Locals can expect the first of eight new buses to be on the road by the end of the year, the Transport Minister said. 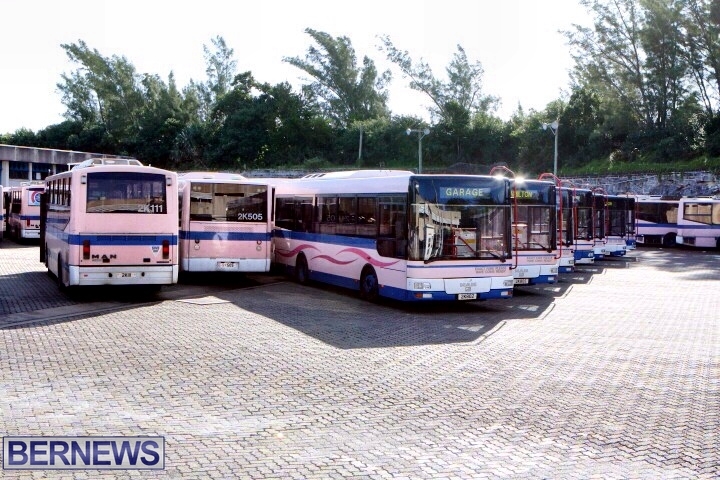 Deputy Premier and Minister of Transport and Regulatory Affairs Walter Roban told Bernews that great strides had been made in the past five days to help address the concerns of workers at DPT and part of those concerns were getting new vehicles for the island’s aging bus fleet. He said his department fully understands what the issues were that brought about the work to rule. Minister Roban added commitments had been made by both sides so now the focus is on building the relationship going forward. He said these long-standing issues have gone on for years. “There are issues around the condition of the facility, particularly down in St. George’s,” Minister Roban said. “Some of the issues deal with the condition of the fleet and improvement towards the fleet. He said an additional $1 million is going into a refurbishment programme to help give new life to some of the older vehicles of the fleet. “In the 2018/19 budget, we have another $3 million lined up for investment as well. That doesn’t include some of the other things we are doing. One of the boogeymen that have plagued his predecessors is getting a new schedule approved. “There hasn’t been a genuine change in the bus schedule in 20 years. We need to look at where is the highest usage; where is the demand? He added the lack of scheduling change in the past would not hamper his future efforts with the union. He said this would help eradicate the rash of cancellations the public have had to deal with from the bus service. “We are employing a plan to address the issues of the cancellations. We are now working on a plan of changing the schedule and the roster based on the availability of buses,” Minister Roban said. “So that there will be little or no cancellations and maintaining a service that Bermudians know that they’re getting. Minister Roban added he would make an effort to be more engaged with the leaders of the BIU surrounding matters pertaining to the DPT. “We will do our best to deal with things before they arise,” the Minister said. “There is a process in place to deal with that. There will be more effort between meetings to talk and ensure that everyone, …myself and management are accessible and happy to deal with issues. “We have a vision for the service of public transport,” Minister Roban said. “That is addressing issues that we’ve had such as the lack of staff. “We are in the process of hiring at least four new staff members. Also, Minister Roban said Government is also working the manufacturers to ensure the DPT can get the most out of the current models. Could Electric Buses Work For Bermuda? LOL….I was doing the same when I read this then I get to the comments and see i’m not alone. Everything Roban has said has been said before many years ago. The change to a digital ticketing/tracking system was talked about more than 10 years ago, it never happened just like the schedule. The divers, the union and the ministry are not serious about public transportation in Bermuda. Remember when we used to get 20 new buses in one shipment and this was every few years. Buses were clean and ran on time. It was a pleasure to ride the bus back in the day (and without air conditioning). Just keep Burch out of any talks. These people are so full of diesel. The PLP are full of tails with no dogs. They put out an RFP for digital ticketing for the ferries on extremely short notice. Then they pulled it hours after the submission deadline. Now they’re “investing” in a system themselves. Right now it’s just empty words here. What are Roban’s opinions of the schedule and efficiency? But its NOT Said which year. Smoke generated and the crowd is quite…..
Just think if we did not have that near $600,000 per day PLP caused debt service cost we could be buying at least 8 new buses a week.